Fairmont Newport Beach's flagship restaurant features contemporary California cuisine served in a sunny spot. 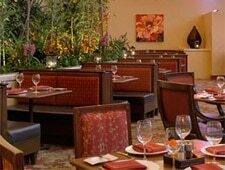 : This Fairmont Newport Beach restaurant is well known for its lush, burgundy and chocolate-hued setting, nestled amongst a sunny four-story atrium festooned with bamboo trees, orchids and palms. Executive chef Brian Doherty and his team create a menu of contemporary California cuisine that emphasizes fresh ingredients and strong relationships with local farmers. Breakfast caters to business types (the hotel is a stone's throw from John Wayne Airport) by rolling out a hot and cold buffet along with plated fare like corned beef hash with Spanish chorizo or breakfast enchiladas. Lunch features an array of soups, salads and lighter bites. However, the star at bambú is the seasonally changing prix-fixe menu at dinner, offering such entrées as sesame-crusted ahi, prosciutto-wrapped free-range chicken or roasted rack of lamb. The wine list is short yet has some notable by-the-glass varietals, mostly from Napa Valley.